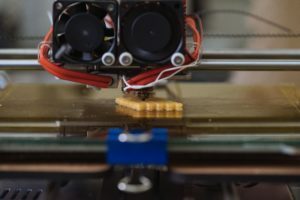 3-D printing still has far to go before it reaches the average collision repairer, but a couple of recent announcements hint at the additive manufacturing possibilities for the industry. Stratasys 3D said last week that Skorpion Engineering used its six Stratasys 3D printers to crank out large, “complex automotive prototypes” far faster than the usual techniques like clay models. The FDM 3D printers are for speed, able to spit out a part in a day, while the PolyJet 3D printers allow for precise, complex shapes, according to Stratasys. Fewer customers want clay; they want “high-performance prototypes” — and in less time, according to Stratasys. 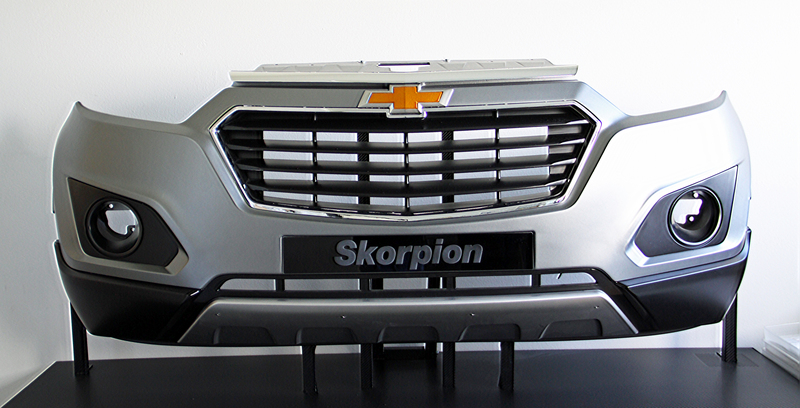 Stratasys wrote that Skorpion used a Fortus 900mc Production printer and its “large build tray” to generate a “full-sized car bumper” fascia 50 percent faster than would have occurred with clay. Prototypes obviously are different animals than real parts, but what Skorpion’s able to do now seems to point to a future where replacement auto body parts are printed on demand rather than mass-produced and stored somewhere. At the least, it hastens the appearance of new automotive shapes. Skorpion and Stratasys hinted at future printing that went beyond the prototype stage and delivered actual production parts. 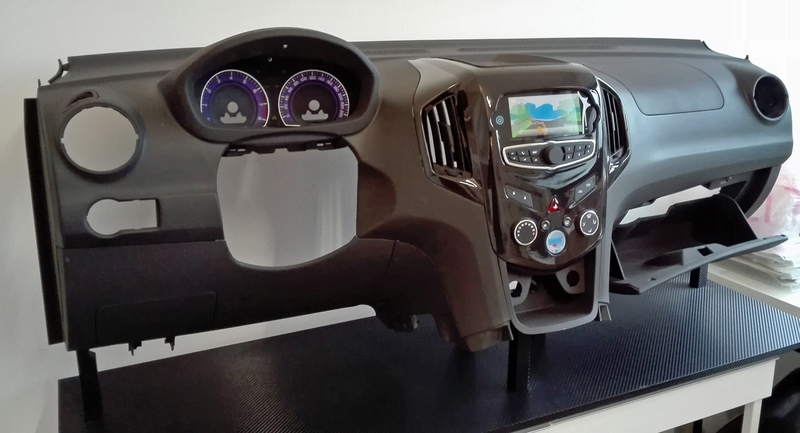 Skorpion also used additive manufacturing to generate “a highly-accurate vehicle dashboard in one print” with both hard and soft areas, Stratasys wrote. Lonnie Love, Oak Ridge National Laboratory fellow and group leader, told a Center for Automotive Research Management Briefing Seminars audience this summer that 3-D printing held the most potential when it came to tooling, as durable, complex shapes can be generated far more quickly and cheaply than under traditional methods. He said the idea of fully 3-D-printed, mass-produced vehicles in the Local Motors model was potentially 10-20 years in the future. However, while arguing that a lack of crash testing could be an issue for a fully 3-D printed car, Love was supportive of the potential for 3-D printing replacement parts. Oak Ridge partner AGCO has a million part numbers — and 30 percent of them sell fewer than one a year, according to Love. The company would like to get its inventory to the point where it “isn’t a massive facility, it’s a data center. You just print out as you need it,” Love said. Rice wrote in a news release Nov. 16 that the “schwarzites,” thought up in the 1880s by Hermann Schwarz and still primarily theoretical until now, could be used for “high-load-bearing, impact-resistant components” in cars — a collision repairer’s bread and butter. Postdoc Chandra Sekhar Tiwary said the structures were like seashells, which have a complicated geometry which protects the soft creature inside. Even more interesting from a collision repair perspective, Tiwary said the schwartzites break exactly how one would like them to break. “The way a material breaks is important,” Tiwary said in a statement. “You don’t want things to break catastrophically; you want them to break slowly. These structures are beautiful because if you apply force to one side, they deform slowly, layer by layer. The printed version was able to match the atomic model to some degree, according to Rice. 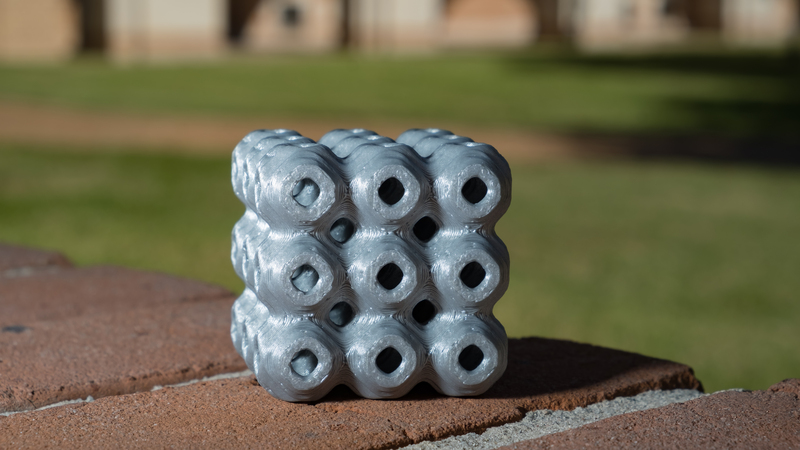 “It is a little surprising that some atomic-scale features are preserved in the printed structures,” University of Campinas professor Douglas Galvão said in a statement. “In tests, both transferred loads across the entire geometry of the structures no matter which side was compressed,” Rice wrote. The scientists are planning to try and reduce the amount of polymer used so the structures can be even lighter. “In the far future,” the researchers might try and print the parts out of metal or ceramics “on a grander scale,” Rice wrote.